Is Industrialisation the answer to Kenya’s Economic Problems? Industrialisation is often touted as the answer to development in Kenya and Africa as a whole. Industrialisation here refers to the process in which a country transforms itself from a society based on primarily agricultural and natural resource extraction into one based on manufacturing of goods. There is already indication that the government is grappling with the issue of industrialisation as seen in a proposal, made a few weeks ago, to end the importation of second-hand clothes and vehicles. The argument is that imports should be curtailed in order to foster industrialisation in the East African Community (EAC). This is import-substitution industrialisation, which is essentially a trade and economic policy which advocates replacing foreign imports with domestic production premised on the notion that the region should attempt to reduce its foreign dependency through local production of industrialised products. This has been a dominant theme in development economics targeting mass poverty and increasing productivity within a given country or region. It is an inward-looking economic theory focused on bringing developing countries into the prosperity of industrialised nations.In all fairness, this position makes sense in some ways; the intention of ushering in development and self-sufficiency by moving beyond agriculture and natural resource extraction through subsidising vital industries is laudable. As it stands, non-industrialised countries such as Kenya are dependent on industrialised ones because they have no alternative but to buy manufactured goods which lead to a vicious cycle. Further, industrialisation can be a useful link between rural and urban areas where the outputs of one feeds into the inputs of the other. Successful industrialisation also relies on efficient and functional transport and communications systems. Industrialisation can also lead to creation of better links between rural and urban areas as well as improve transport and communications. It can also improve Kenya’s export profile, which is a trade deficit country. Indeed, Kenya recorded a trade deficit of Sh86,484 million in January 2015 alone. Industrialisation can also play an important role in creating products which meet domestic needs can be exported to earn forex. In terms of function, industrialisation forces companies to compete with international competitors in terms of quality and price. At the moment EAC governments are seeking to facilitate industrialisation by banning imports of second-hand goods. The upside to this is that it allows new industries the time and space to get their formula right. Yet a ban on imports means that inefficiencies and sub-standard goods will be allowed to flourish, limiting choice and forcing consumers to buy expensive goods of potentially low quality. Not only is this against the poor but it can also lead to industrialisation supported by protectionist government policy which can cultivate a culture of mediocrity. Industrialisation also poses additional challenges such as whether Kenya has the following: a variety of raw materials to produce finished goods, a constant supply of affordable energy, a large number of engineers, a dependable supply of both skilled and unskilled workers as well as capital goods and money for investment. Further, the creation of by-products and waste has to be carefully managed to avoid chronic, dangerous pollution from becoming the norm. As Kenya eyes industrialisation as a catalyst for economic development, a cost-benefit analysis must be done to determine how it can be structured to spur sustainable development. This entry was posted in Development economics, Economics, Emerging Markets, frontier markets, Kenya, Political Economy and tagged Africa, import substitution, Industrialisation, Kenya, protectionism, Trade. Almost two weeks ago Kenya experienced yet another horrific terrorist attack credited to militant Islamic group Al-Shabaab. The human loss experienced is immeasurable and Kenyans are still reeling in the aftermath of the massacre. Terrorist attacks do not only cause loss of lives, they also have long-standing effects on the economy. Terrorism here refers to premeditated, politically motivated violence perpetrated against non-combatant targets by sub-national groups or clandestine agents, usually intended to influence an audience. In general, terrorism reduces consumers’ and firms’ expectations for the future and forces governments and the private sector to invest in security measures and redirect investment away from more productive economic uses. For example, many firms in Kenya spend considerable capital on security costs which is essentially unproductive in that it does not add to their output or improve their product quality. Terror attacks in Kenya have also triggered geopolitical conflict, which is causing further economic disruption by increasing the likelihood of future attacks. Direct costs of terrorism include the value of assets damaged or destroyed such as plant, equipment, structures and merchandise. Economic activity is disrupted so lost wages and other forms of income are also part of the direct costs of terrorism. The direct costs of the attacks on Westgate for instance were estimated to cost Sh10 billion. In terms of indirect costs, Kenya’s ability to attract FDI has been hit by such attacks. Indeed, analysis reveals that the presence of terrorist risk corresponds to a decline in the net FDI position equal to five per cent of GDP. This is attributed to the creation of climate of uncertainty that envelopes the country whenever attacks happen. This prevents potential investors from making new capital investment as they are unsure of the economic implications of the attacks and thus overlook Kenya for more stable economies. Indirect costs of terrorist attacks also affect the transportation industry because demand for air travel declines, passenger fares decline, and the inability of heightened airline security personnel to readily process travelers lead to further declines. Tourism in Kenya has obviously been a casualty with travel advisories discouraging foreign nationals from travelling to the country which is particularly bad as often warnings on non-essential travel attract remove insurance cover. Ironically, the travel advisories may fuel terrorism further. How? Well, by contributing to the collapse of the coastal tourism industry, the travel warnings may simply be increasing the joblessness, idleness, poverty, drug use and overall desperation—all well-known catalysts of terrorism. Other indirect costs of terrorism could include the pain and suffering of the victims and their relatives as well as the psychological trauma experienced by a stunned nation. Psychological trauma may have negative short-term impact on productivity. Interestingly in other countries such as the US, the 9/11 attack had a stimulating effect on the economy where monetary and fiscal authorities stimuli were effected to offset the macroeconomic consequences of the attacks.Because of damage accrued, there was a surge in the private sector demand for liquidity which was met by the Federal Reserve cutting short-term interest rates and increasing short-term lending (discounts and repurchases). Further a $40 billion emergency spending package provided a strong fiscal stimulus. But sadly developing economies such as Kenya often cannot take such action because they do not have ready access to international capital markets and the fiscal authorities cannot redirect already strained expenditure. This entry was posted in Africa, Development economics, Economics, Emerging Markets, Kenya, Political Economy and tagged Africa, economic consequences, economic performance, emerging economies, Kenya, terrorism. There is a little known branch of economics called Economic Geography that Kenya could pay attention to in order to gain new insights on factors that inform social and economic development. It is essentially the study of location, distribution and spatial organisation of economic activities across a region, and the implications to development.The pertinence of the field of study lies in how the development of Kenya and Africa, or the lack thereof, can essentially be seen as a function of geography. Some within this field argue that the underdevelopment of the continent is a case of ‘bad latitude’ and that income disparities within and between regions can be explained by erratic climates, poor soil, low agricultural productivity and infectious disease which then mutually reinforce each other in a ‘vicious cycle of destitution’. Jeffery Sachs makes the point that one of the reasons Africa has such a high burden of disease is because we do not have a winter; and winter essentially makes it impossible for most infectious agents such as parasites, viruses and bacteria, to survive. As a result, countries such as Kenya face chronic onslaughts of high levels of infectious agents because of our geographical location. If Africa were located in European climes, some argue, it would be Africa and not Europe that would have economically dominated modern history. One study even goes as far as saying that if Zimbabwe were located in central Europe, the resulting improvement in its market access would increase its GDP per capita by almost 80 per cent. A country’s geographical location also pins down its position on the globe with regard to other countries and centres of power. This determines the importance of a country in international relations that in turn affects economic development. 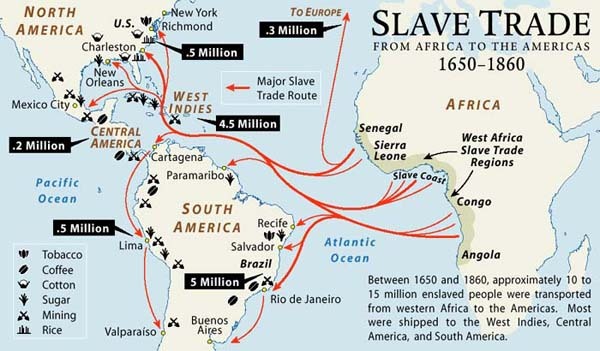 Some argue that one of the factors that fed the Trans-Atlantic slave trade is the proximity of the eastern coast of the USA and the western coast of Africa. If these regions had been further away perhaps a different area would have suffered the horrors of slavery. In Kenya a similar argument holds; the choice of Nairobi as the nexus of power by the British may have informed why regions in and around Nairobi are more economically developed than those in the outer regions such as North Eastern. Perhaps had the climate in North Eastern been more to the liking of the British, Kenya’s socioeconomic landscape would be vastly different. Another point made by economic geography is that the sheer size of the African continent negatively affects its economic development. 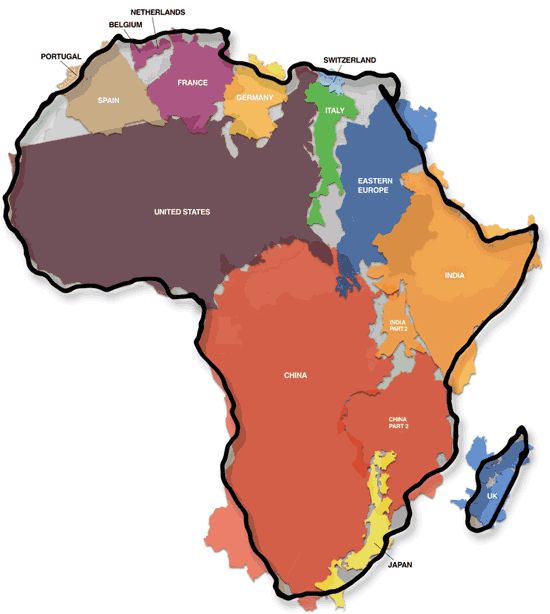 Africa is massive; indeed one can comfortably house China, Japan, India, the USA, Eastern Europe, Italy, the UK, France, Portugal, Germany and Italy in Africa with room to spare. The implication of this on the cost of building infrastructure and ensuring access to all points of the continent is obvious. Indeed a study argues that halving distance between Zimbabwe and all its trading partners would boost its GDP per capita by 27 per cent. If Africa were the size of Europe it would be much easier and cheaper to build infrastructure and interlink the entire continent; a factor that would catalyse economic growth and engender closer socio-political ties. Africa’s geography has also been the foundation of its economic strengths; vast reserves of minerals and metals have been the backbone of the African economy. Sadly, these reserves have deteriorated into Africa’s “resource curse” where rents from minerals in African often tend to accrue to elite and fail to trickle down to the poor. There is an interface between geography and human behaviour. Political instability, the chronic mismanagement of funds by African governments also explain the continent’s limited growth and development, not just its geography. This entry was posted in Africa, Development economics, Emerging Markets, frontier markets, Kenya, Political Economy and tagged Africa, Colonialism, Geography, Infrastructure, natural resources.